Lock in a great price for Mellieha Bay Hotel – rated 8.1 by recent guests! what else do you need more great staff great food great parking and most of all great view. Location is fantastic, we had sea view apartment. Also breakfast is great, there is so many options you can eat or drink. Rooms are not too big, flat tv is fine. Only internet is very slow. Must be improved. Location and view is very nice. The hotel beach and garden is lovely aswell. The bedroom and public rooms in the hotel were all of a high standard. The quality of food & drink was high and the entertainment was good. My husband and I have already been to Mellieha Bay and we found it commendable in all expects. Would definitely visit again in the next few weeks. The price of the wine was very cheap 8 Euro’s for a bottle with our dinner! The grounds of the hotel were lovely, lots of places to escape to. The location is perfect if you’re here to enjoy the beach and get tanned! Have two nice pools and nice staffs. Considering the money I paid, it’s well worth! The view from our room is absolutely stunning. 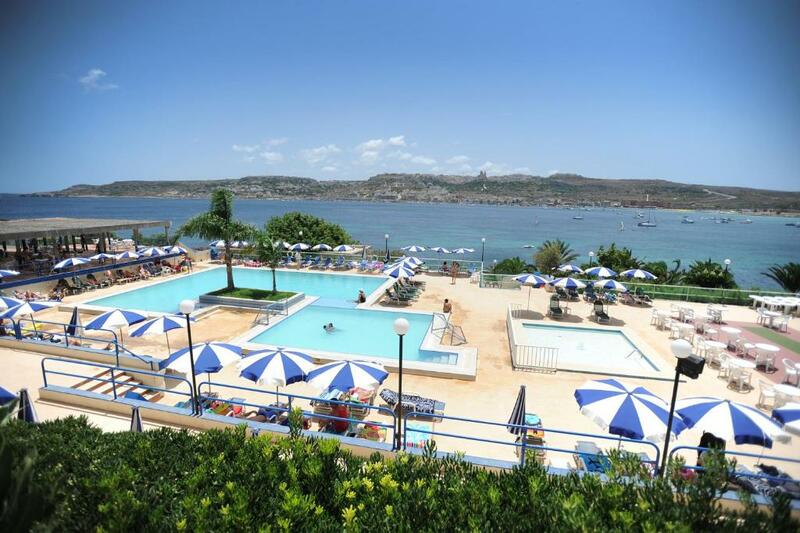 Mellieha Bay Hotel This rating is a reflection of how the property compares to the industry standard when it comes to price, facilities and services available. It's based on a self-evaluation by the property. Use this rating to help choose your stay! 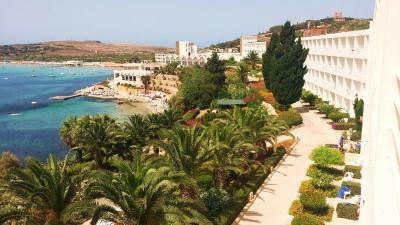 Boasting a private beach area, Mellieha Bay Hotel is set in Mellieħa, 1.2 mi from Popeye Village. Every guest at the 4-star property can enjoy sea views from the rooms, and has access to a seasonal outdoor pool. There is a restaurant. The rooms in the hotel are equipped with a kettle. The rooms are fitted with a private bathroom. The units have a desk. 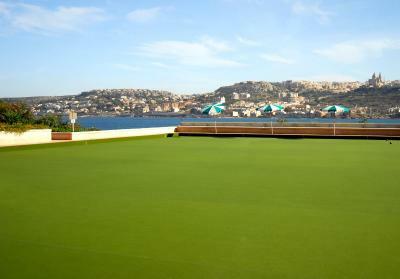 At Mellieha Bay Hotel guests are welcome to take advantage of a small fitness area. Hiking is among the activities that guests can enjoy near the accommodations. Staff at the reception can help guests with any queries that they may have. Ghadira Bay is 2,300 feet from Mellieha Bay Hotel, while Cirkewwa Ferry Terminal is 1.6 mi away. 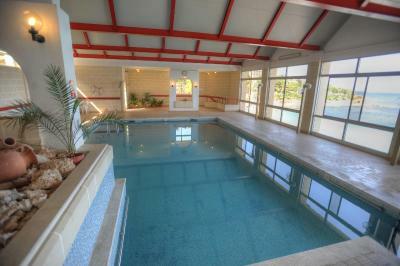 The nearest airport is Malta International Airport, 11 mi from the property. 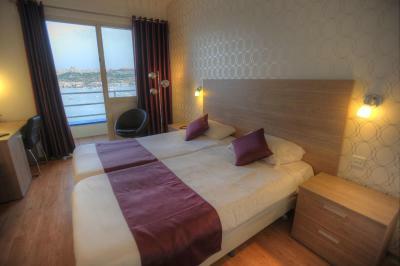 When would you like to stay at Mellieha Bay Hotel? This twin room features air conditioning and patio. House Rules Mellieha Bay Hotel takes special requests – add in the next step! Mellieha Bay Hotel accepts these cards and reserves the right to temporarily hold an amount prior to arrival. Please inform Mellieha Bay Hotel of your expected arrival time in advance. You can use the Special Requests box when booking, or contact the property directly using the contact details in your confirmation. Would have needed a car as it took 95minutes on the bus to Valleta, was too isolated. Beds were hard. Indoor pool too deep for children & no lifeguard . The pillows are bad, not fluffy. The corridor always scared me. The a/c in the room didnt seem to work. some parts of the hotel looked run down and just needed a good tidy. Loved the amazing garden was lovely to walk in on a nice sunny weekend right near the beach. 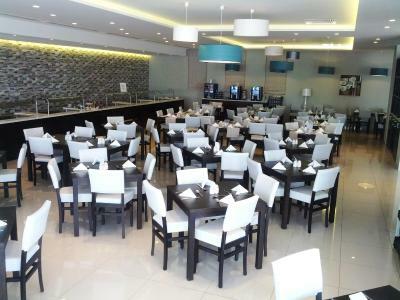 Food was very good too and staff were very friendly. Hotel was very clean and all round our mini weekend break was so relaxing. Unfortunately, the bedsheets were stained with what looked like blood when we got into the room. Moreover, there were cockroaches in the bathroom, which really destroyed our comfort from then onwards. To be fair, management then compensated us with a free bottle of wine for our troubles. Breakfast was really good, and there was a huge variety that we could choose from. Indoor pool was also very clean and not very crowded, meaning that it was a very pleasant swim. 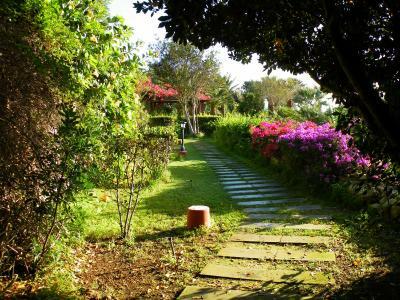 The hotel is simply a haven of tranquility. We had the all inclusive package and it was a good value for the money we paid. would love to stay there again however it is fully booked!! City escape guaranteed. Enjoy the silent and stunning sea view. Beds terrible, freezing. Long cold damp corridors that's smelt of cats urine, no proper entertainment. Bar opens 8pm to 1145, too far from anywhere. Bar managers didn't really want to be there and were ignorant to customers and staff. Bed was not very comfortable, no spa facilities, gym too small and lacking equipment. View from room extremely nice, staff was friendly, room was clean, food was good.